"Chronic Fatigue Syndrome" by Shanghai killer whale via Wikimedia Commons is licensed under the Creative Commons Attribution-Share Alike 3.0 Unported license. These findings are described in the article entitled Overcoming the effects of sleep deprivation on unethical behavior: An extension of integrated self-control theory, recently published in the Journal of Experimental Social Psychology (Journal of Experimental Social Psychology 76 (2018) 142-154). This work was conducted by David T. Welsh from Arizona State University, Ke Michael Mai from the National University of Singapore, Aleksander P.J. Ellis from the University of Arizona, and Michael S. Christian from the University of North Carolina. Current trends suggest that employees are working longer hours and getting less sleep than ever before. Unfortunately, sleep deprivation has a number of negative outcomes in terms of occupational safety, decision-making, and task performance. There is growing evidence that there are ethical consequences of sleep deprivation as well. Given recent corporate scandals and reports of widespread employee unethicality, such findings are concerning for both organizations and society at large. We all have the sense that we’re not our best selves when we’re sleep deprived. This is because the ability to regulate one’s behavior through self-control is limited. In everyday life, many behaviors require the use of self-control from rising early for work rather than hitting the snooze button, to choosing a salad for lunch rather than chocolate cake. As researchers have demonstrated, this holds true for many ethical choices as well. It might be tempting to take an ethical shortcut, lie to avoid getting in trouble, or browse the internet on company time. When someone is sleep-deprived, such temptations are simply more difficult to resist. Given these findings, what actually determines whether someone has sufficient self-control to resist unethical behavior? In our recent study titled “Overcoming the effects of sleep deprivation on unethical behavior: An extension of integrated self-control theory,” published in the Journal of Experimental Psychology, my coauthors and I suggest the answer may be more nuanced than was previously thought. It would be intuitive to assume that the unethical consequences associated with sleep deprivation present merely a “capacity” problem. In other words, sleep deprivation has drained an individual’s capacity for self-control, creating a problem that can only be solved with more sleep. Yet, we suggest that this narrow perspective does not accurately capture the factors linking sleep and ethicality. Our findings reveal that ethical self-control is not just about whether one’s capacity has been depleted by a lack of sleep but is also influenced by features related to motivation and effort. In other words, the behavior of someone who is sleep-deprived can be influenced not only by factors that restore capacity (i.e., sleep) but also by factors that influence this person’s levels of motivation and effort. These findings were supported both in online samples of working adults and experimental studies where we kept undergraduates up all night in a laboratory. One motivation-related factor that we explore is one’s sense of power. Power is often assumed to have a corrupting influence. Someone who feels in control has the opportunity to take advantage of others and in some situations research has supported this conclusion. Yet, in the domain of sleep we find that because power makes one feel in control, it actually offsets some of the negative ethical effects of sleep deprivation. In sum, power can not only corrupt but can provide a needed sense of control. We also examine an effort-related factor in the form of contemplation. When one is sleep deprived, there may be a tendency to act impulsively. However, taking the time for contemplation reverses some of the negative ethical effects of sleep deprivation. In some situations, the old adage to “sleep on it” makes sense. In other situations, this serves as a reminder to not rush to impulsive decisions when one is sleep-deprived but to put in the extra effort at a time when it is difficult to do so by engaging in contemplation. What our research suggests is that overcoming the effects of sleep-deprivation has multiple aspects. One aspect involves increasing one’s capacity for self-regulation. This involves physiological factors such as increased sleep or, as demonstrated in some of our prior research, the consumption of caffeine. Another aspect involves psychological factors related to motivation. Here, it is not only having the capacity for self-control but also feeling like one is in control. A final aspect involves behavioral factors related to effort. Here, the effects of sleep deprivation can be partially offset through increased contemplation in order to reach a better decision. This suggests a number of both short-term and long-term solutions associated with sleep deprivation and ethical decision making. In the short term, getting additional sleep may not be a practical solution for someone who has already started their workday. However, psychological and behavioral factors related to motivation and effort may nevertheless be helpful in terms of ethical decision making. For example, a sleep-deprived employee might recognize the need to engage in more deliberation when making a big decision than usual. By thinking through a decision in depth, the employee may be better able to resist negative impulses. Or, a manager might bolster an employee’s sense of power by reminding the employee about the degree of control that the employee has in making an important workplace decision. In the long term, effective ethical decision making may involve not only increased levels of sleep but also an increase in psychological and behavioral factors that increase motivation and effort. For example, an employee might choose to make an important ethical decision in the morning when fatigue levels are low and there is time for contemplation rather than in a rush at the end of a long workday. Or, a manager might look to enhance employee ethical decision making by helping employees to have the requisite capacity, motivation, and effort to be at their ethical best. 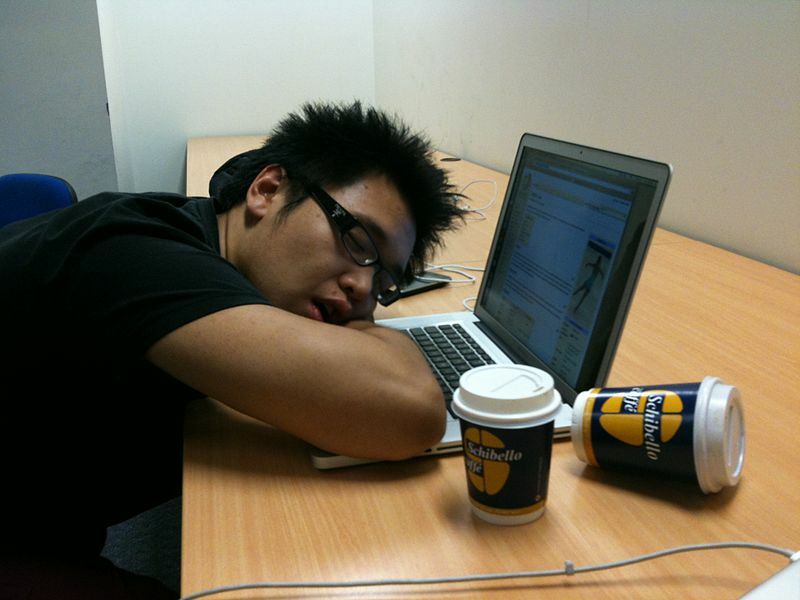 In sum, sleep deprivation is an important problem with ethical consequences for employees and organizations. Being one’s ethical best self requires not only the capacity for self-control but also the necessary motivation and effort. Thus, overcoming the effects of sleep deprivation requires an understanding of not only sleep itself but also related processes that can increase the motivation and effort involved in ethical decision making. David Welsh is a Professor of Management at Arizona State University, W.P. Carey School of Business.